The September meeting of the W.C.T.U. met in the Cong. church Sept 16 1919 with our new president Mrs. Kirk in the chair. 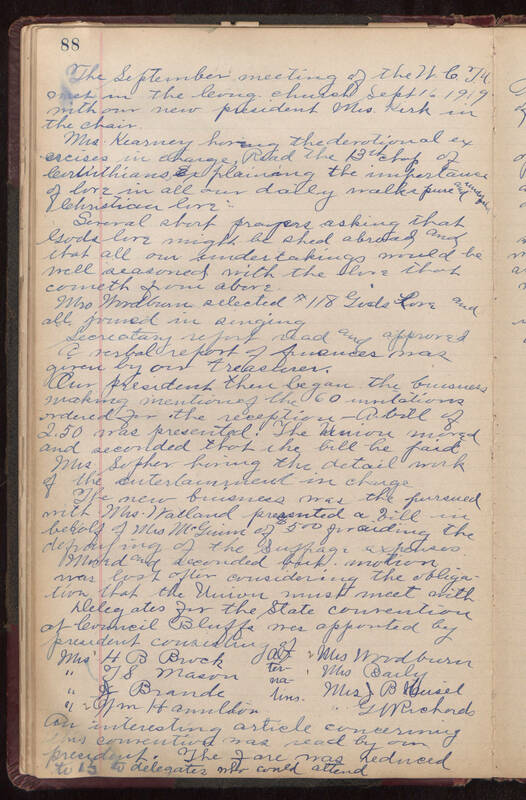 Mrs. Kearney having the devotional exercises in charge, Read the 1th cahp of Corinthians, explaining the importance of love in all our daily walks pure and underf...[illegible] Christian love. Several short prayers asking that Gods love might be shed abroad and that all our undertakings would be well seasoned with the love that cometh from above. Mrs Woodburn selected #118 God's Love and all joined in singing Secretary report read and approved. A verbal report of finances was given by our treasurer. Our president then began the business making mention of the 60 invitations ordered for the reception. --A bill of 2.50 was presented. The Union moved and seconded that the bill be paid. Mrs. Sopher having the detail work of the entertainment in charge. The new buisness [sic] was the [sic] pursued with Mrs. Walland presented a bill in behalf of Mrs McGuinn of $500 [$5.oo?] for aiding the defraying of the suffrage expenses. Moved and seconded but motion was lost after considering the obligation that the Union must meet with delegates for the State Convention at Council Bluffs was appointed by president consisting of Mrs H B Brock " T S Mason " [illegible] Brande " Wm Hamilton Alternatives 2 Mrs Woodburn 1 Mrs Baily " G W Richards An interesting article concerning this convention was read by our president. The fare was reduced to [illegible] to delegates who could attend.